Territorial Expansion of the Innermost Continent marks sculptor and painter Sarah Trigg’s first solo exhibition since the launch of her book STUDIO LIFE: Rituals, Collections, Tools, and Observations on the Artistic Process (Princeton Architectural Press)—a comprehensive archive of her writing and photography about artists’ collected objects, rituals, makeshift tools, residue from processes, and engagements with studio environments. Territorial Expansion—which connotes the results of an archaeological dig—begins with five loosely figurative works—deities. Light gray clay forms contain swaths of residual acrylic paint from past processes suggesting internal organs. Bright aluminum armature wires draw limb-like lines, evoking otherwise imperceptible bodily forces. Adjacent to these works is a collection of more abstract tabletop sculptures championing the irrational and untranslatable with titles such as Measured Without Proof and Your Accent in a Foreign Country. Alongside these geometric pieces are the geode-like spheres Halved Planet with Multiple Cores, displaying unexplained internal activity. Circling the room are wall pieces created primarily of paint and of irregular form—eschewing the traditional support of a canvas or panel. Works such as Mudslide Forgets the Past have porous, earth-born surfaces and in Earths in Torso (Green/Magenta) the geological markings and planes suggest tectonic activity. Huddled in a corner, Lovers is a facing duo of columns constructed in layers of dried commercial housepaint, cast in their cans. These works, from the artist’s Cast Paint series, are larger versions inspired by the series Another Word for Chess, presented here on a mirrored pedestal. This latter series originated from Trigg’s return to her studio after her sojourn documenting and writing her book, only to find that her acrylic paints had dried in their containers. 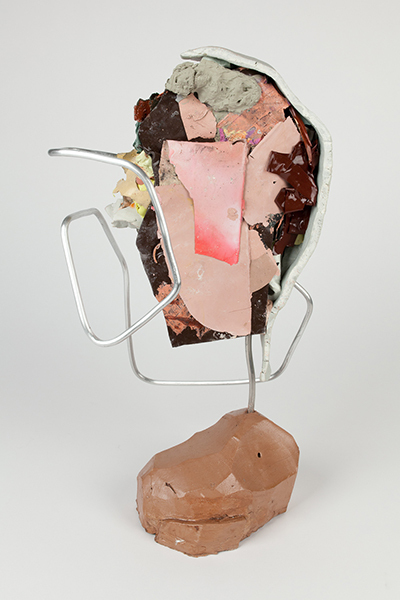 Cracking them open like egg shells she used the unintended castings as a starting point to create stacked column-shaped pieces from the studio’s ongoing ecosystem of residue. She thinks of them as geological core samples of her studio practice. The works are highly tactile, offering the viewer a greatly needed reprieve from our technologized world. This curative balm pairs with a steady, albeit calm, statement regarding the knowledge unearthed by the recent #metoo events as well as other issues of social injustice. Emblematic of this are the wall pieces Embers Remember All of colorful forms submerged, perhaps surfacing, in a reddish pebbly terrain, and Smoulders Not Done, 2019 of various carbon black textures and traces of pink. Both works suggest the presence of an immutable force. The show also stands as a statement on the creative process inherent in artists as well as in all beings—a subject studied at length by Trigg for the research of her aforementioned book STUDIO LIFE. For her four-year investigation, Trigg met with artists throughout the US with a focus on New York, Los Angeles, Chicago, Miami, and San Francisco. The book features 100 artists including Carol Bove, Diana Al-Hadid, Rashid Johnson, Barbara Kasten, Simone Leigh, and Tony Oursler. Trigg continues to host visits on her blog site thegoldminerproject.com. Born in Appleton, Wisconsin, Trigg lives and works in Brooklyn.